The Institution, laws & ceremonies of the Most Noble Order of the Garter / collected and digested into one body by Elias Ashmole. Elias Ashmole was one of the founding members of the Royal Society, a collector and antiquary. On the restoration of the monarchy in 1660 under King Charles II he was appointed to the College of Arms as Windsor Herald. In this position he devoted himself to the study of the history of the Order of the Garter, which had been a special interest of his since the 1650s. 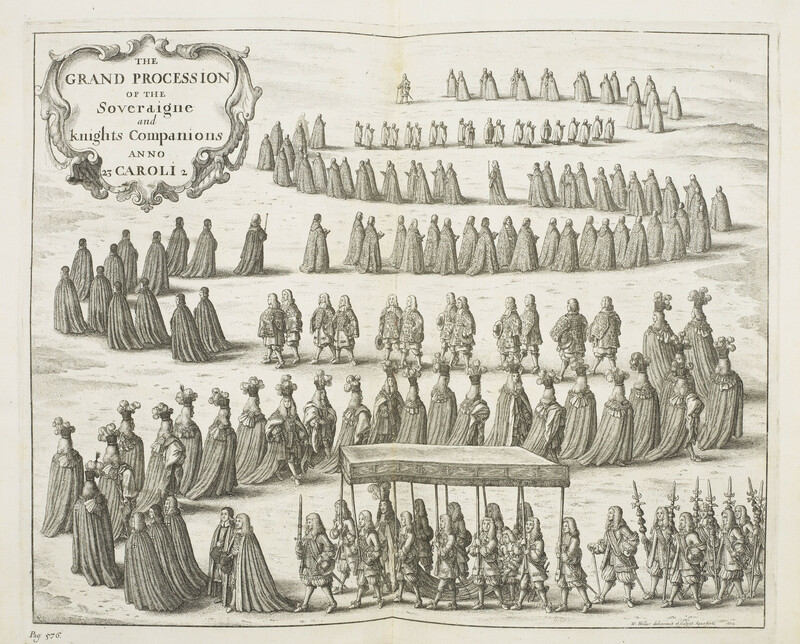 The resulting publication, 'The Institution, Laws and Ceremonies of the Most Noble Order of the Garter', published in 1672, was a lavish folio with illustrations by Wenceslaus Hollar. A significant portion of the work was written in 1665 while Ashmole was living in the country to escape the Great Plague which was then raging in London.